Kindle: This is my first holiday with a Kindle instead of packing 8-10 paperbacks in our cases! For years I’ve said I would never get one as I love the feel of reading a proper book, but since I started my new job last Summer and spend a lot of time commuting on trains, it made sense to get one so that I didn’t have to cart books everywhere with me. I’ve already read a few books on it in the past couple of months and have grown to love it! Some titles I’ve downloaded for poolside reading include Becoming by Laura Jane Williams, #Girlboss by Sophie Amoruso and Between You & Me by Lisa Hall. 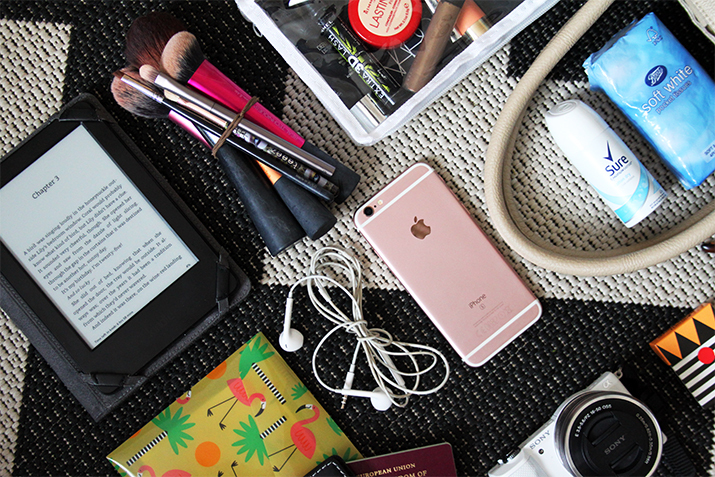 Make Up & Brushes: The last couple of times I’ve been away, I’ve packed my makeup in a clear cosmetic bag in my hand luggage, purely out of fear of losing it all if our cases ever went missing! I also worked in Berlin for a few days where a colleague packed her make up in her suitcase and opened it when we arrived to find a bottle of nail polish smashed all over her make up and brushes. You can imagine the carnage!! I don’t tend to wear a lot of make up on holiday, only in the evenings, so I’ve just packed the essentials for a full yet low maintenance face. My brushes are also bundled together with a couple of hair ties, so not only are they neat and tidy in my bag, but I’ve also got a couple of bobbles there should I need to tie my hair up on the plane. Travel Pillow: I always see people with these polystyrene bead filled pillows on flights, but I never see them anywhere in shops at home (only the rubbish inflatable types) and refuse to pay airport prices. This year though they seem to be absolutely everywhere! I bagged this mint green cityscape one for just £4 from Primark, and it has a handy clip to attach it to the strap of my bag. iPhone & Headphones: Obviously I’ll be switching this to airport mode on the flight, but to keep myself entertained mid-air or whilst we wait to board, I can keep up to date on social media, Youtube or listen to some music. Also essential for the obligatory airplane selfie or window shot. 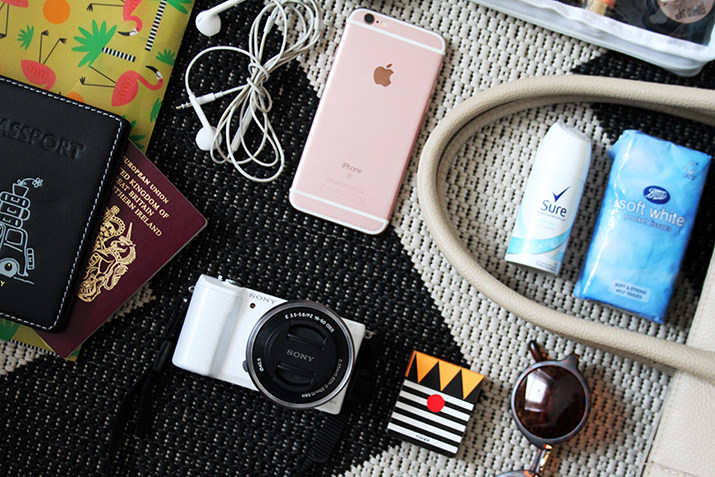 Toiletries: I always make sure I have a little pack of tissues (#hayfeverproblems) and a miniature deodorant in my hand luggage, especially if the flight’s more than a couple of hours. I also like to carry a little packet of face wipes, just in case! Travel Documents & Passports: A no brainer, otherwise we wouldn’t be getting very far, but what I really wanted to show you was the cute flamingo print document wallets that I found at Tiger. I think they were 2 for £1, so I got one for our outward tickets and passports, and one for our Euros and insurance documents. So much more organised that scrappy plastic wallets! Camera: I’m always scared of putting this in my suitcase, in case it gets crushed or scratched, so it’s always for the best to keep it in my handbag. We got this Sony A5000 last year and it’s one of the best purchases we’ve made. It’s small and compact so it fits in even the smallest of bags, it’s image quality is similar to a DSLR and it even has a selfie mode with a flip screen! We got some great photos with this on holiday last year, so it’s of course coming along with us again. Sweets: I hate the dreaded ear popping during take off, so I always make sure I have a pack of sweets to eat to ease it. These little sweets from Tiger are perfect, taste incredible and come in the cutest packaging! Sunglasses: We’re going to be landing at around 5pm when the sun is low in the sky, so I figured keeping a pair of sunnies in my bag would come in handy when we start the descent in to the airport and the blinds have to be up! These round shades were just £2 from Primark and are some of my favourites right now! 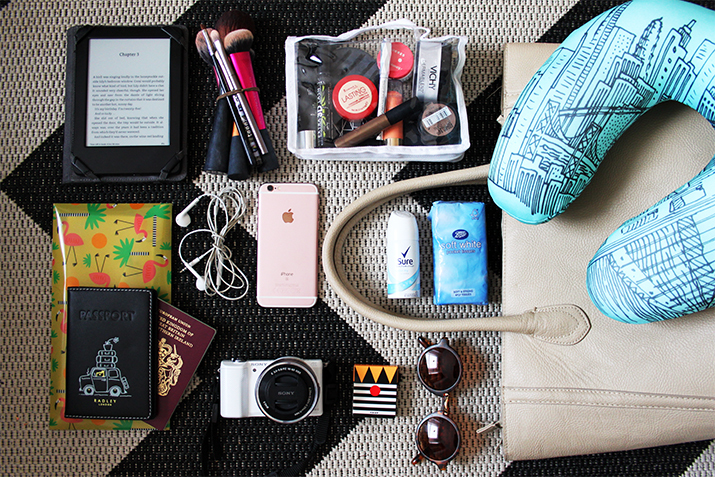 What are your essentials for keeping in your hand luggage? Are you heading off on holiday this Summer? Im going away later in the year this post will be handy so I don't forget anything.